Raavan. Ram. And Mani Ratnam. Unlike with Thalapathi, in the case of Raavan we see a more literal adaptation of the Ramayana. We have the jumping man to represent Hanuman, we have the Polygraph test for the Agnipareeksha, we have a Surpanakha nose grabbing scene, we have a fat Kumbakarna, and we have everything, absolutely everything as in the Ramayana. Too literal, you say? Huh. Before jumping on to such half baked conclusions, think why? Why would Mani Ratnam bring in such loud and blown up references in his version of Ramayana? It never occurred to you that there could be a reason? Here, Mani Ratnam has retold Ramayana exactly like you’ve known it. Just like the Mariyadhapurushotham Ram, Dev is a duty bound cop who fights against the evil to his last breath. He respects his duty above all his personal relationships (even his wife). The perfect cop, if you will! And Beera is the evil local terroriser, who kills people at will (the policemen, for instance), possibly involved in a lot of ‘asura’ deeds which are not shown in the movie, but which should’ve clearly happened, for the cops can’t be behind him without a reason. But our director has masterfully arranged his movie, giving emphasis to the Ram/goodness in Raavan (mostly that) and the Raavan/evil in the Ram. A small but a genius twist of perspective! From the outermost layer, in the movie, Beera is the good guy and Dev is the bad guy. But that’s definitely not the end of story. 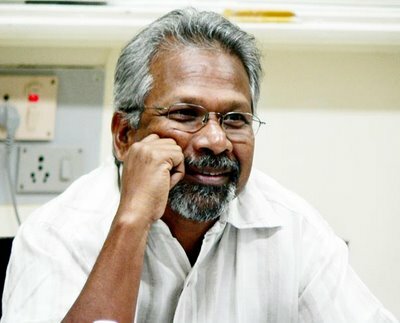 What the 54 year old Mani Ratnam does here is nothing short of challenging the mighty Ramayana-one of the most respected and worshipped epics of Indian Mythology (Or at least its popular renditions). The ultimate purpose of the movie is to bring out that dash of goodness in Raavan (please note, not in Beera, but in the classic asura character ‘Raavan’!) and the evil in the God like Ram and thus to suggest the futility of the concepts of good/evil etc. Where Surya (from Thalapathi) works as a derivative of Karna, the representation of Beera as Raavan is much more aspiring. Beera is that part of Raavan we have ignored. Or probably that part of Raavan we were never told of. And in that sense, Raavan is not just a movie based on Ramayana, but rather a movie about Ramayana! This ambitious angle would have never worked without the movie following the epic so literally like it has done. If ‘Raavan’ was a movie about a thief and a cop with subtle references towards Ramayana thrown here and there, then in no way would have it been able to affect our perception of the original epic characters. Now that is why the movie is made the way it is. And that’s why Mani Rtanam is a Genius. Hope I did make that one point clear enough. This, I think, is one neglected bit about the movie that can make a whole lot of difference on how people judge it. Moving on now, the movie is definitely not free of flaws. The major flaw being with the casting section of the movie (Which is more prominent in the Hindi version). Abhishek Bachchan could do only very little justice to the most demanding character of his career. It definitely feels like he tried real hard. But at the end of the day, I believe, acting is more of an inborn talent more than anything else. That’s not saying AB is low on that talent. I still see him as one of the better actors around. But this bloody role was simply asking too much from him. Vikram in Tamil has notably done better as Veera but that too was not really perfect for me. As an actor, I find Vikram a little too loud. Which is mostly an okay thing down south! Also, within that one limitation, Vikram is a very good actor. Here, probably his style of acting has helped him much. Now Vikram as Dev in Hindi didn’t come up to Prthiviraj’s Dev in Tamil. It must be because of the language, but in Hindi, there seemed a little bit of a disconnection bit the body language and the dialogues of Dev. Aishwarya Rai Bachchan looked gorgeous and reminded a lot of us about Iruvar. But except for that, ash was terribly miscast. The rest of the supporting cast did okay. The Tamil actors (Like Prabhu) seemed a little better than their Hindi counterparts, though. Priyamani, was probably the best casting decision that has happened with this movie. She was wonderful in both the versions. Also there are a few other technical glitches here and there, but nothing too bothering, IMO. And the technical side of the movie has received much praise everywhere. The cinematography is sensational, not just for the use of graphics (the dragonfly and such fancy stuffs) or the lush green forests, but for the deeply emotional close up frames that dominates throughout the movie. Also you can find interesting textures in most of the frames, sometimes it is the rain, some other time it’s just some white dust particles in the air. Editing is top notch too. I don’t know why Big B has said this, but for me the movie is so full of inventive editing (Or maybe I know why he said that!). Sound editing is also very sharp and brilliant. The art direction, the costumes (white and black contrast in Beera/Dev costumes) are all some of the best we have seen over the years. The movie upholds a certain mood from the beginning and all these factors contributes to the mood quiet amazingly. All these and the breathtaking Background score from ARR. I could never understand why so many of you found it uninspiring but I for one, found it to be nearly as good as Rang Da Basandi’s score. And BTW, the quality of the songs in the album are an entirely different case! So, that’s about it. Huh, and like in most of the other Mani Ratnam movies this one is also loaded with its share of political subtexts like Maoism and the like. Also there was an obvious Veerapan reference in Veera. But those are just subtexts. Added bonus with any Mani Ratanam movie, if you will! So, Raavan is not Mani Ratanam’s best movie ever (Iruvar, forever!). But it’s certainly one of his most ambitious attempts. And it deserves a lot better than remarks like ‘Mani ke Aag’ and all that. Please. Also I would like to add this one final thing, I saw Raavan two times (the Hindi and the Tamil versions). And I wasn’t bored. Not a single bit. P.S: One weak/confusing link with the direct adaptation of Ramayana is in the Killing of the Vibhishana character. Actual Ram never kills Vibhishana instead takes him on his side. But Ram, later during the war, kills Meganath, the undefeatable son of Raavan, cheating him with the help of Vibhishana. Maybe that was the story angle interpreted there. P.S.S: I would personally recommend the Tamil Version. This entry was posted on Thursday, June 24th, 2010 at 3:27 am and is filed under Movies, Reviews. You can follow any responses to this entry through the RSS 2.0 feed. You can leave a response, or trackback from your own site. 2 Responses to Raavan. Ram. And Mani Ratnam. Bro i must say that was a good analyse about raavan. you have done a tremendous job in character analyzing! raavan is not at all a great film from this veteran director! But this not at all his worst work. I havent seen the film. But I heared the critics by some big heads saying they preferred Abishek than vikram, as the one who performed well and has done justice to the role.